I am very pleased with cover and service. Well made, fits perfectly and is more comfortable to sit on than the leather upholstery. Where have you been all my life !!! 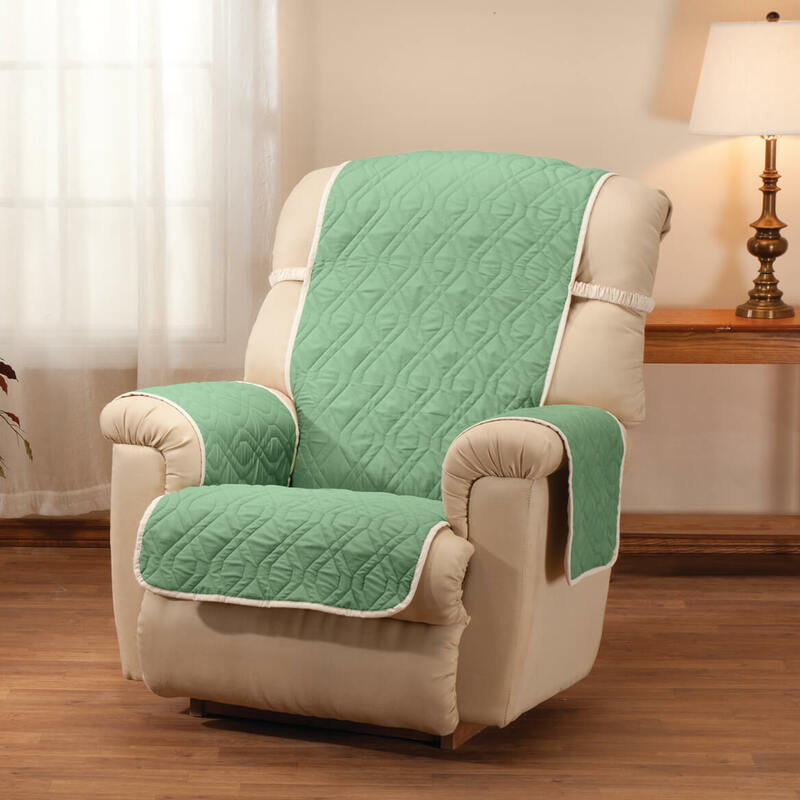 After years of putting small covers over the arms and a large pillow sham over the back -- all of which constantly slid off -- I'm thrilled to have found this EXCELLENT recliner cover. No slipping off. Plenty room to tuck in corners. Bands provide a secure non-slip fit. I'm 5'1", 200 pounds and it totally stays in place !!! And it feels great -- soft and cushiony. Pockets are great !!! It's reversible (pockets on the reverse as well) and waterproof !!! I did test this out with drops of water, which just rolled off. When I rubbed them in, the underside stayed dry. Definitely a win win !!! I think it's also supposed to be stain resistant. If so, definitely a win win win !!! Love it !!! Bought a couple of these. It is very nice and fits well. Stays in place due to back elastic straps. Looks good on furniture. I put this on my recliner and it looks great and more importantly it stays put! Really like that you get two colors to choose from also. It was a gift for my daughter. She liked it so much that she wants to get another one for another chair. 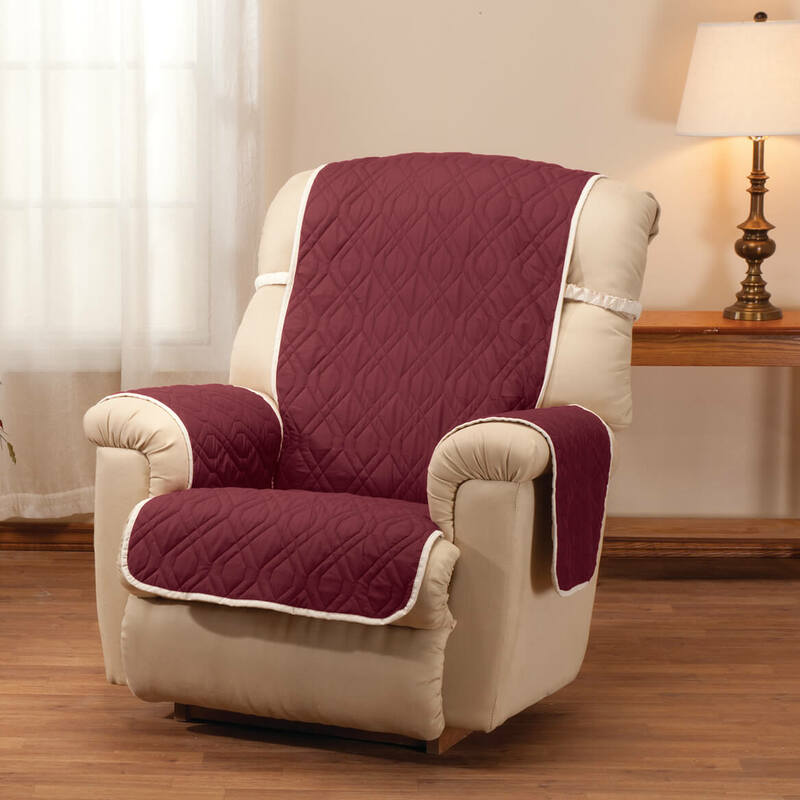 Great color and fit, this cover should fit all recliners! It isn't possible for me to evaluate properly, as it was for a family member who died last week. Is just what I was looking for. Better than advertised. Highly recommend... would buy again! I am happy with the cover. Would have liked a few more colors to choose from. 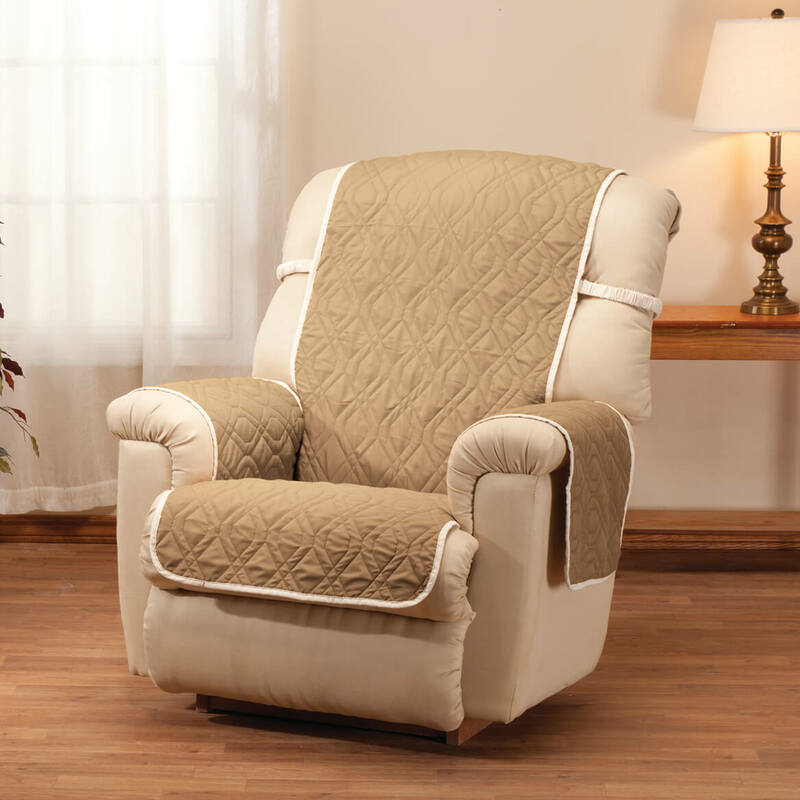 I use this product to help protect the recliner exterior from daily wear and tear. Like the elastic straps that help hold it in place. It holds in place very well. Like the choice to be able to use the opposite side of this product to a different color change. Over all I think I made a excellent choice purchasing this product. I'm very happy with it. The only one of it's kind! 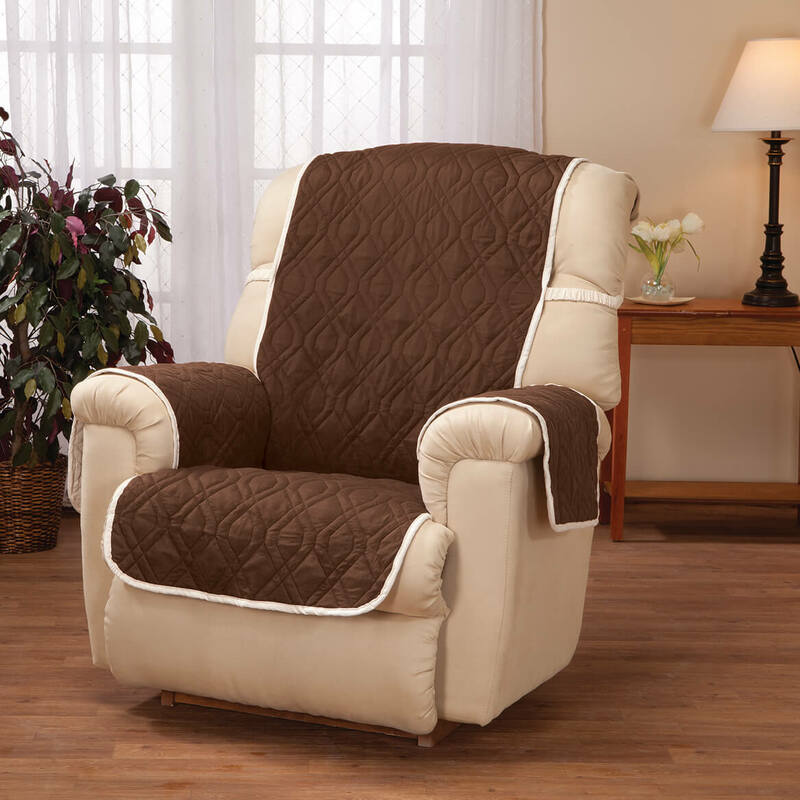 This is the only recliner chair cover I've found with an unobtrusive band that firmly secures the front to the chair so it doesn't slip off leather as chair moves back. My other covers look more sporty and fall off with continued chair use. The style fits with traditional, country, or modern furniture. 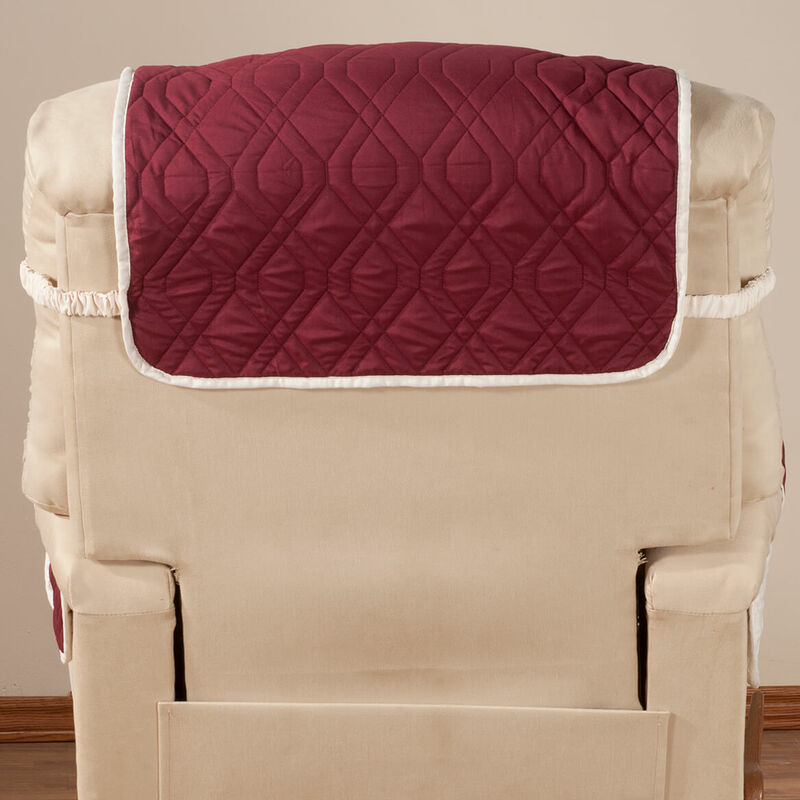 I bought this to protect a leather recliner , as a family member uses it for sleeping each night. It stays nicely on the back of the recliner, due to the straps. The instructions mentions tabs for the sides but there weren't any. I tucked in the sides and it looked great , but when our family member slept in it, the pieces that protected the arms slid off . Perhaps it's our recliner and the size of the person, but it doesn't stay as pictured. I certainly like the idea of the product, but I'm hoping it could be redesigned so it will completely stay as pictured. I liked the style of the furniture protector. 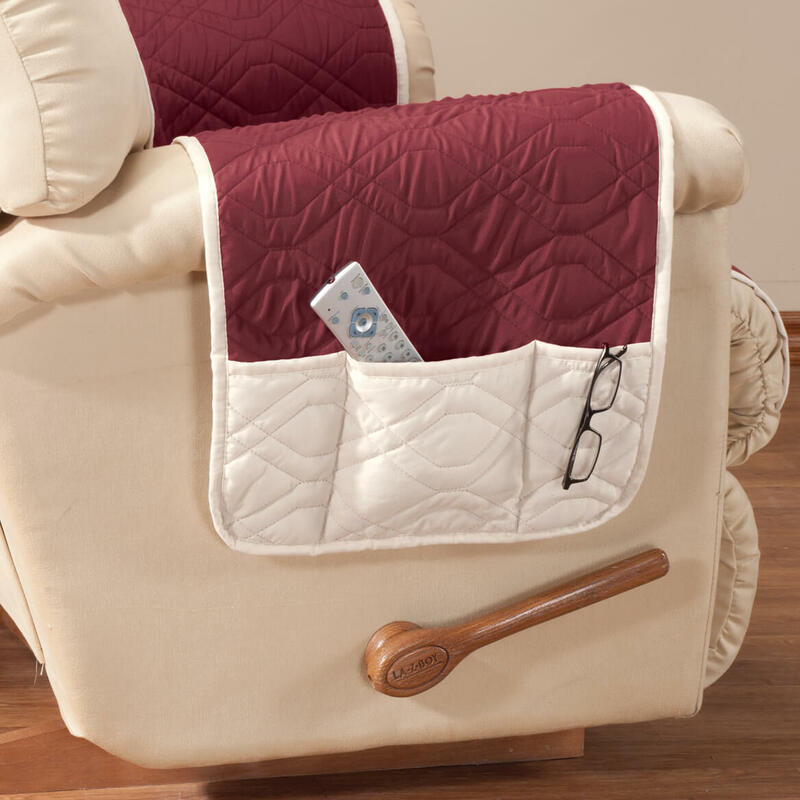 It has a pocket for my mother to store items as she watches television. it's reversible... I see it as 2 for one price, Thanx!! To keep my recliner clean. Because I wanted a good quality cover. My previous cover wore out and wasn"t that great of quality. I have a dog that thinks it's her chair LOL! I liked it best after reviewing others. I WANT TO PROTECT MY RECLINER. LOVE THE FACT THAT IT IS WASHABLE. Extending the life of my beloved recliner. It's waterproof and it will fit my recliner. I have a special needs child that sits in his recliner and needs protection. To protect my new chair and it was reasonable. The side pouch will hold my home defence Wepon. Because it was waterproof it was the tall back and it was a nice pick hopefully wont ruin very easily. 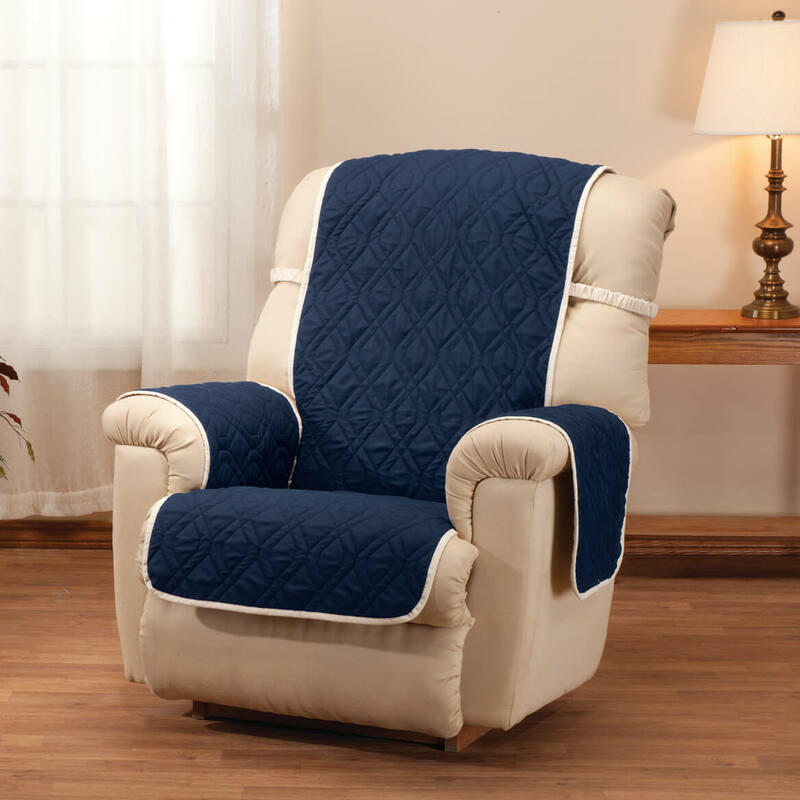 Needed oversized recliner cover and reviews were good. 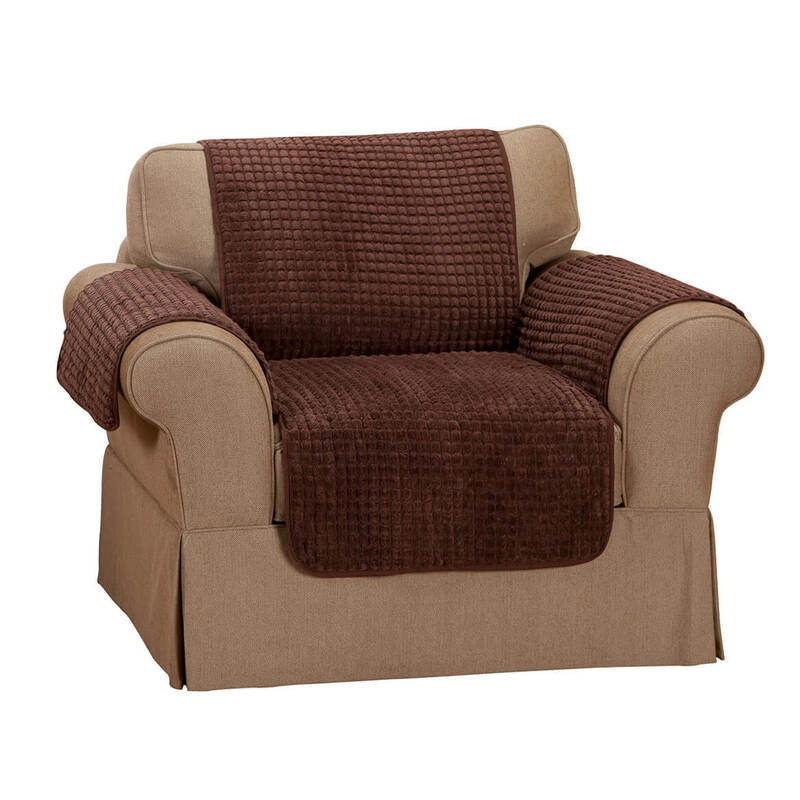 We brought one for a previous recliner and liked it. waterproof, easy to use, color selection. 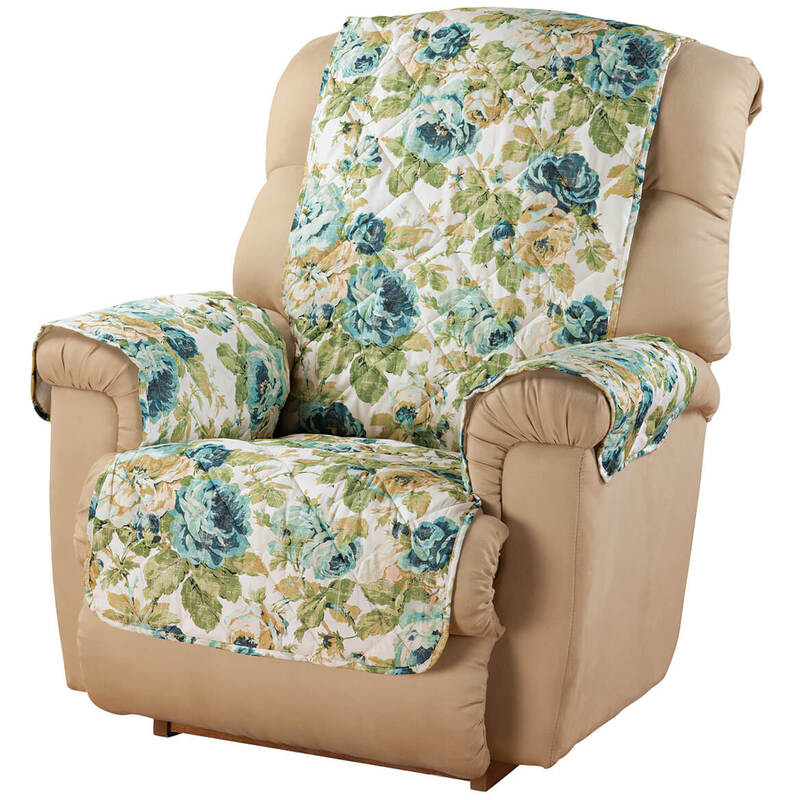 Purchased this for my mother's lift chair. She spends a lot of time watching tv and snacking. I like the idea of a elastic band to help hold the top in place. 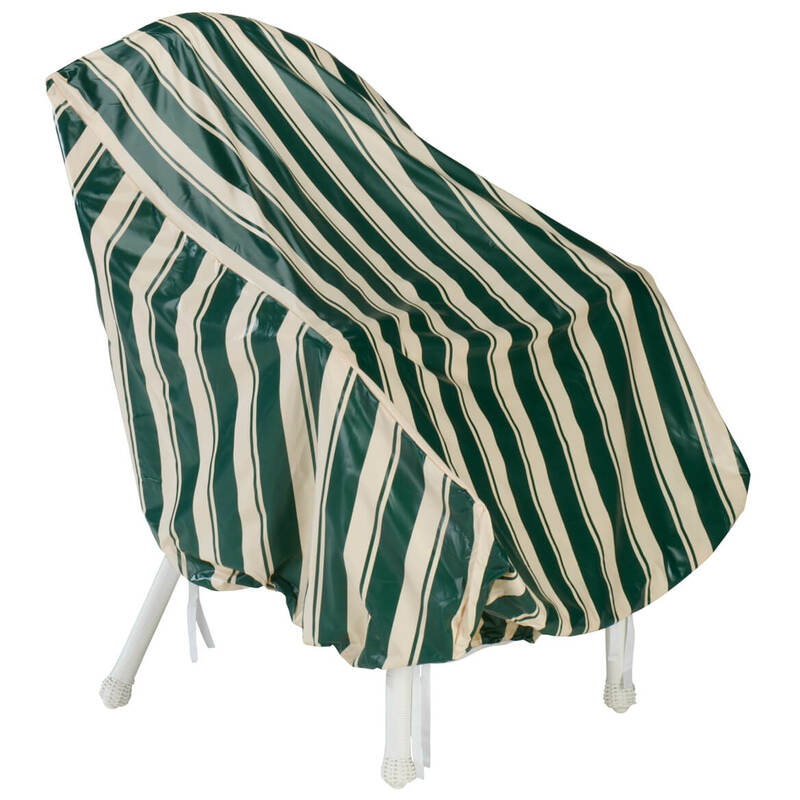 These are great especially the straps keeping them in place and they wash/dry wonderfully. Look nice and protect chair very well !!!! Secured in the back. It's for my elderly Mom and she will sometimes slide in the chair. One that is just placed on the chair would not have stayed in place. I have a brand new recliner. 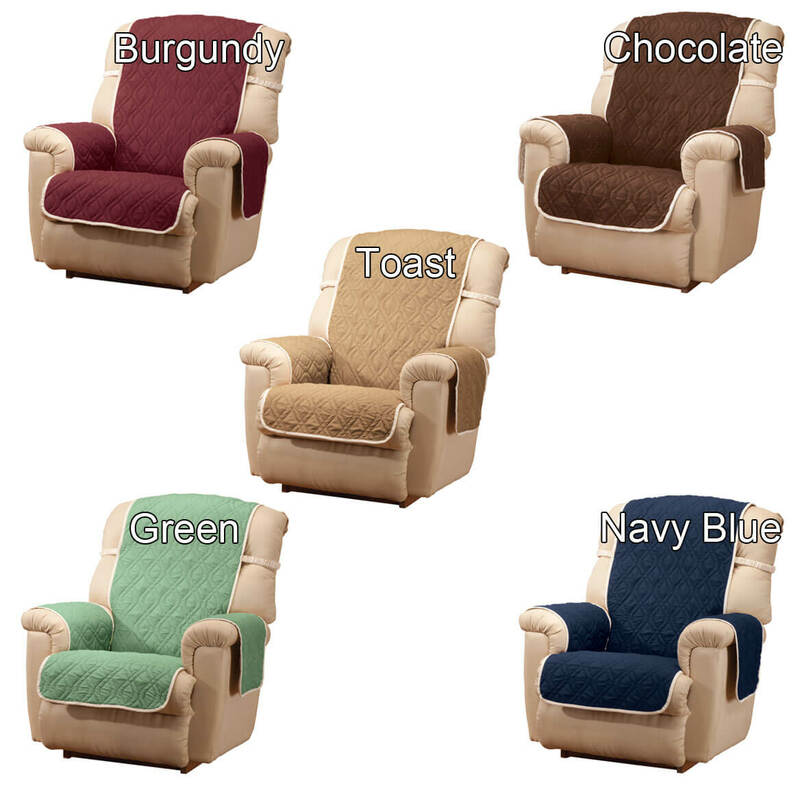 I read the reviews and that helped me to decide on these recliner covers. My chair was showing ware. This is my second order, made well, love the look, washes and line dries perfectly. What side is the pocket located on? BEST ANSWER: Pockets are located on the right side as you are sitting down. If you are facing the chair the pockets are on the left side. facing chair it is on the right side. the width is listed as 23". Is this just the width of the seat or the width measuring the entire width including the arms? BEST ANSWER: Thank you for your question. The 23" width is for the entire furniture cover. We hope this information will be of help to you. 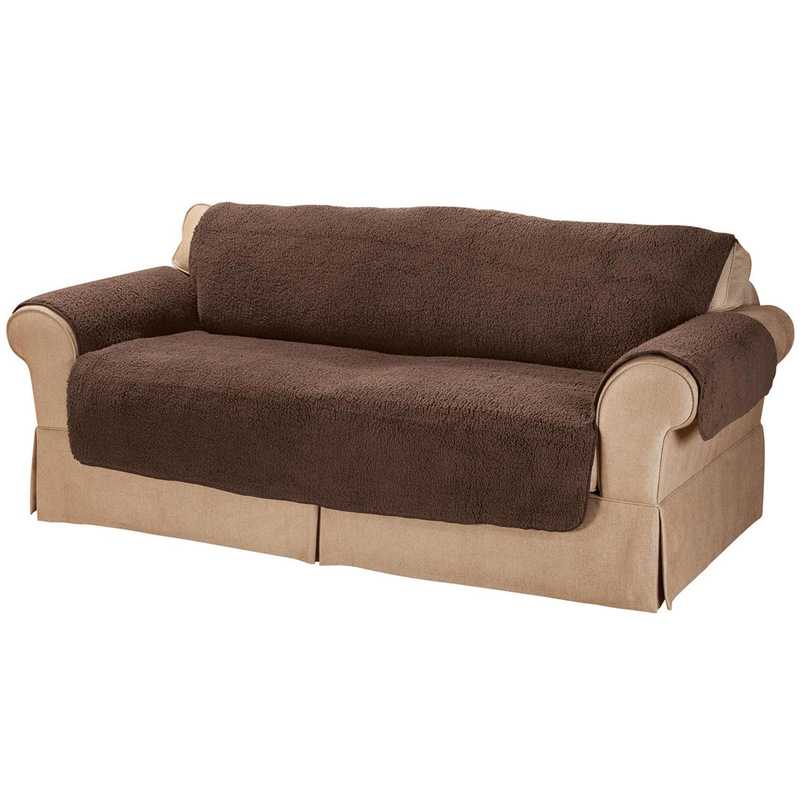 Loveseat - does this cover come in a loveseat size? BEST ANSWER: Thank you for your question. Unfortunately the recliner cover will not fit a love seat. We hope this information will be of help to you. Is there a matching sofa cover? BEST ANSWER: Thank you for your question. There is not one that specifically matches this one but we have a wide variety of covers. We hope this information will be of help to you. there are a lot of covers you just have to look for them. BEST ANSWER: The toast color is light brown or beige. Does this come in any other colors? I need a Natural Cream color that is NOT GOLD. BEST ANSWER: Thank you for your question. "Toast" is the lightest color this comes in. We hope this information will be of help to you. where is the matching couch cover? 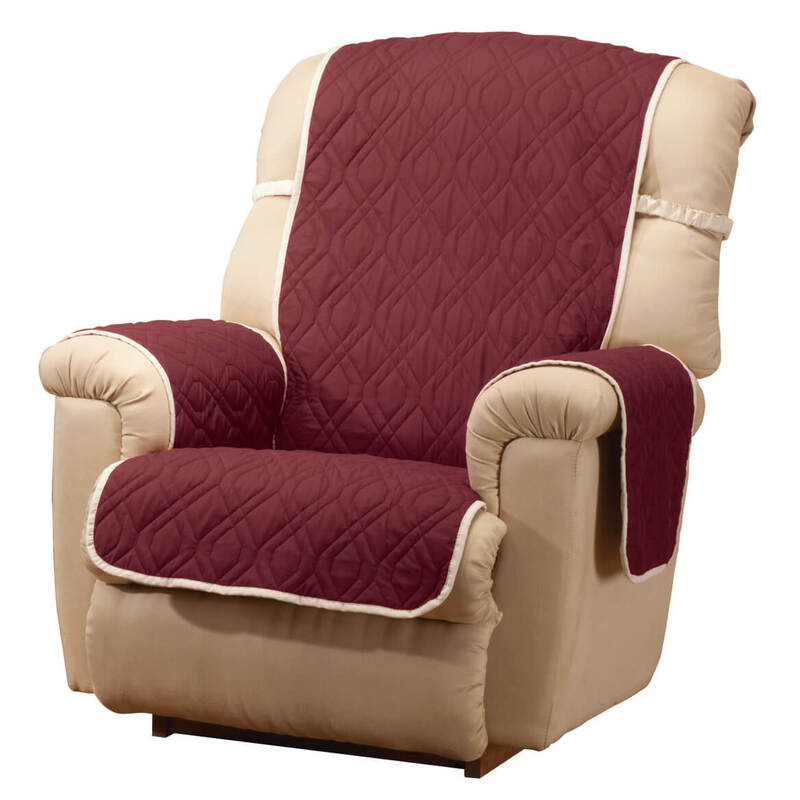 I do not see the recliner cover pictured in the TVWeekly magizine with promo code OCAPR5COVER? The cover for the chair looks perfect. But I also need a cover for the ottoman. Any suggestions? BEST ANSWER: Thank you for your question. 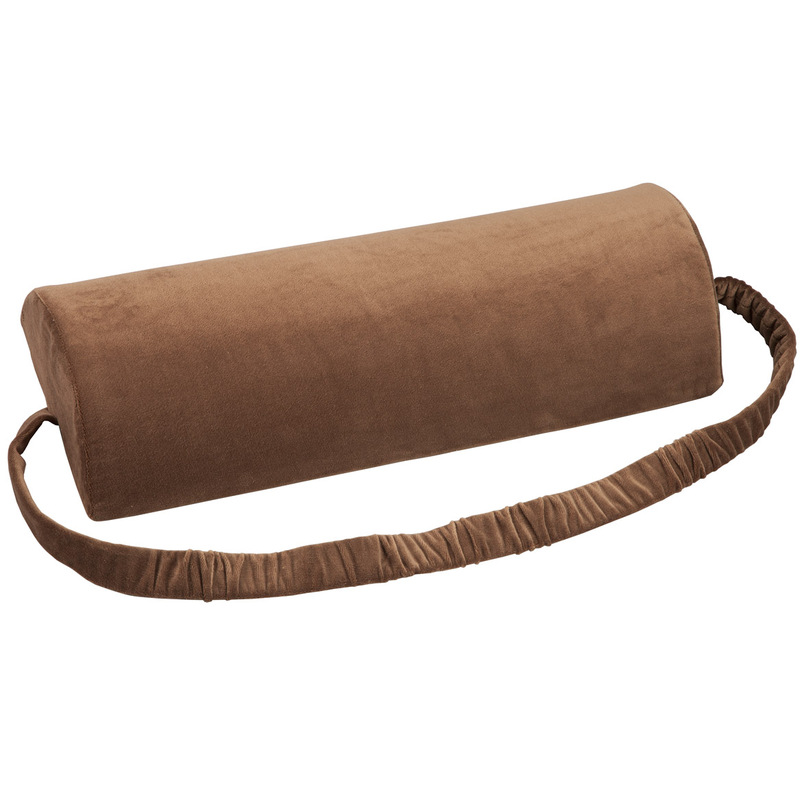 Please click on the following link it is the only Ottoman Cover we carry. We hope this information will be of help to you.